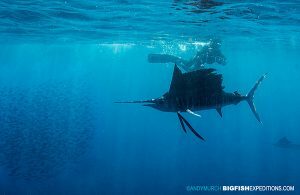 We managed to get out and hunt for sailfish everyday. During the trip we had lone sailfish, groups of sailfish on bait balls, a visit from a pod of friendly Atlantic spotted dolphins and a brief encounter with a whale shark. Our first day at sea was a bit bumpy due to high winds but it was nothing we couldn’t handle. However, there wasn’t much bird activity. 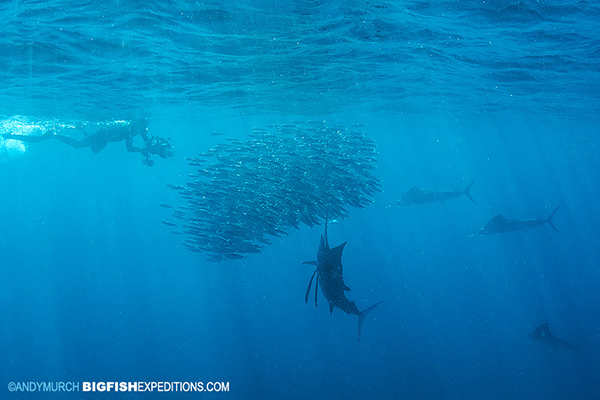 The sailfish corral sardines in deep water and push them to the surface where they are pinned and helpless. Then they systematically pick away at the ball of fish until there are none left. In order to find the action, we rely on frigate birds to show us where the fish are. When the frigates find a bait ball they form a cloud above it while they wait for it to reach the surface where they can swoop in and pluck fish from the ball without getting wet. We did see a couple of small bait balls by following the birds and there was clearly activity under the surface but if the bait ball is small its not always easy to reach it before the action is over. Even though we didn’t get any dynamic encounters, we did at least get a close pass from a sailfish so we were reassured that they were in the area. Day Two – Thats not a Sailfish! By day two the wind had calmed down considerably. There was also a lot more bird activity but it was mostly dorado feeding on flying fish. 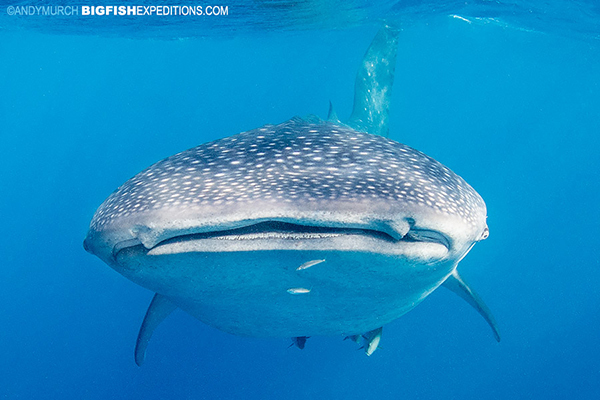 While looking for the main event, we stumbled upon a lonely whale shark swimming northward. Whale sharks visit the northern Yucatan in great numbers later in the summer but it was a surprising encounter at this time of year. 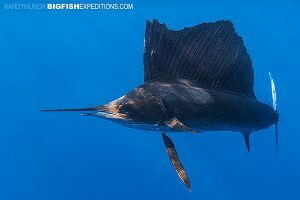 Although we had had a taste of what the Mexican Caribbean has on offer, we were ready for some serious sailfish action. Fortunately, day three heralded calm seas and plenty of birds. It didn’t take long to get our first bait ball. It wasn’t huge but everyone was excited anyway. 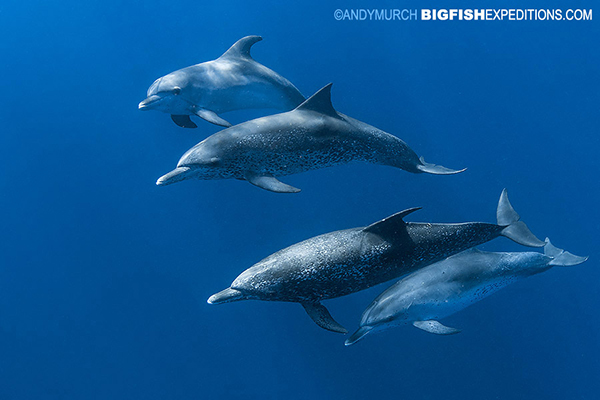 After we jumped on a couple of small feeding events, we ran into a pod of dolphins. As beautiful as they are, dolphins are generally bad news when you’re looking for sailfish because they break up the balls. Fortunately, these weren’t bottlenose dolphins. 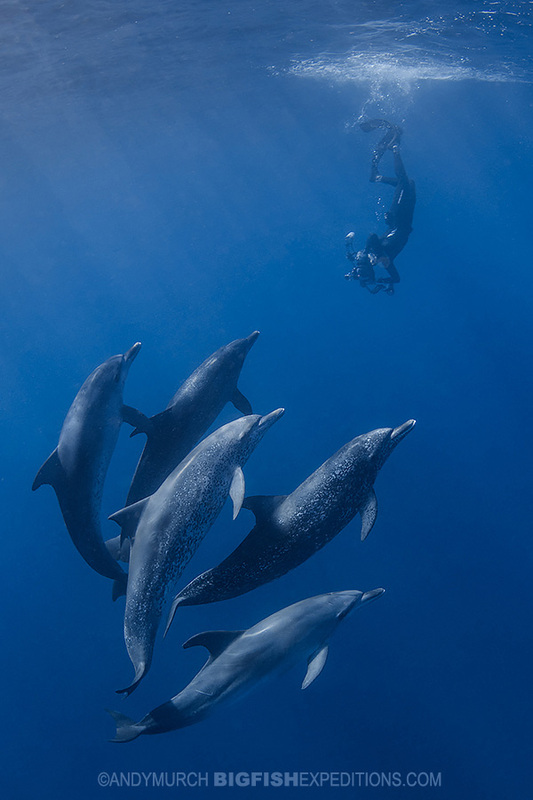 They were Atlantic spotted dolphins; a playful species that love to interact with humans so we jumped in and tried to keep up as they ran circles around us. I could have played with the dolphins all day but the captain called us back to the boat to go in search of more sailfish. We continued the hunt and came across plenty of hapless sardines. The bait was running fast and it was not easy for us to keep up with the action but everyone got some good views of these lightning fast predators. Final Day – Rough seas and a painful encounter with the boat deck! Its not unusual to lose a day or two to weather when chasing sailfish in the Mexican winter so we were not surprised when we woke up to windy conditions on our last day. Everyone was still keen to give it a try so we headed out into the weather. It wasn’t that bad but clearly rougher than the previous days at sea. After searching for a couple of hours we spotted a huge flock of frigate birds working a bait ball in the distance. As we scrambled to get ready, one of our guests was surprised by a wave and his knee hit the deck awkwardly. It soon became apparent that it wasn’t just bruised so we turned tail and ran back to port leaving the activity behind us. It was a good thing we did because his knee cap was broken by the impact – our first and hopefully last serious injury on one of our trips! We left Mexico in good spirits even though one of us was on crutches. It was a fun trip with a great group of enthusiastic guests that I hope we see again. 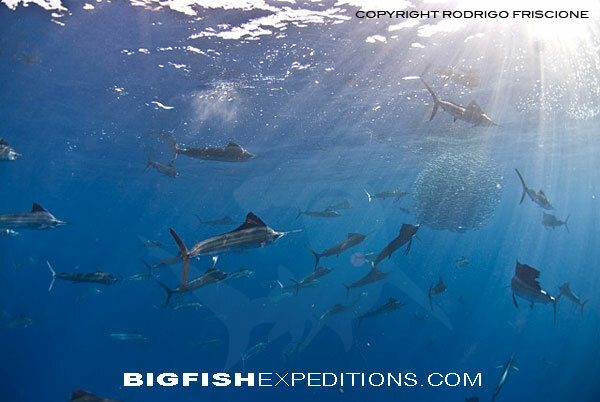 Next year we’re heading back to Mexico from February 5th to 10th to roll the dice with the sailfish once again. 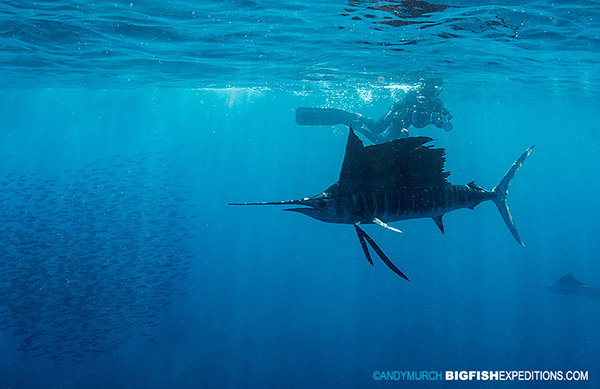 There is no question that this is not an easy trip but the chance of seeing scores of sailfish decimating a huge ball of sardines is too tempting to resist!